Inside view, [showing middle tiers of] Akbar's Tomb, Sikandra, Agra. bl.uk > Online Gallery Home	> Online exhibitions	> Asia, Pacific and Africa Collections	> Inside view, [showing middle tiers of] Akbar's Tomb, Sikandra, Agra. 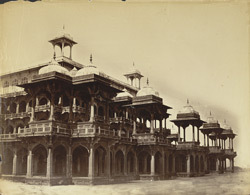 Photograph showing the chattris or domed pavilions of Akbar's tomb at Sikandra in Uttar Pradesh, taken by an unknown photographer in the 1880s, part of the Bellew Collection of Architectural Views. Sikandra, a short distance away from Agra, grew in the reign of Sultan Sikandar Lodi (ruled 1489-1527), after whom it is named. It is however best known as the site of the tomb of Mughal Emperor Akbar (ruled 1556-1605). It is said that Akbar selected Sikandra for a garden site and he may well have begun construction of his tomb when he died. It was completed between 1612-14 by his son Jahangir (ruled 1605-27). The mausoleum, on a high plinth, is square in plan and features five receding tiers and is arcaded on all four sides. It is located at the heart of a four-part garden layout, known as a 'char bagh' design, in which four waterways running from central gateways to the tomb at the centre divide the square garden into four parts. The four water channels represent the four rivers of Paradise as described in the Quran, with the heavenly gardens in which the tomb is placed creating fitting surroundings for the last resting place of a famed emperor. The tomb's tiered pavilions culminate in a white marble edifice at the top which shelters the cenotaph inside from the elements. The actual grave of Akbar is in the crypt deep inside the mausoleum.